What is corporate storytelling, and why is it so valuable? 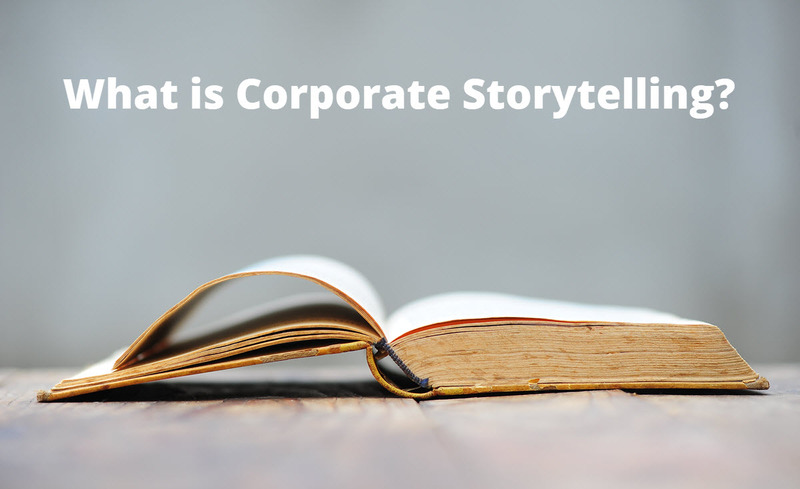 Corporate storytelling is, well, just what it sounds like…telling stories at work. But let’s face it, most of us don’t know how or where to begin. How can we possibly persuade and motivate our manager, prospects or customers into action through a story? Like any book, movie, or play, corporate storytelling can take people on an emotional journey. And, bluntly put, humans are suckers for an emotional journey. When presented authentically with strong logic and visuals to bolster your message, a well-crafted story is sure to drive people to act. Facts and data presented with no story are often difficult to follow because they lack context. Haven’t ALL of us experienced presentations with endless bullets and charts that leave us bored, confused, and remembering nothing? Weaving a story into a product update, customer pitch, or recommendation is remarkably simple. In fact, corporate storytelling sells ideas in any format…from from . Bottom line: story structure strengthens all forms of communication. How does corporate storytelling lead to getting decisions made? The end goal of nearly all business communications is producing a decision, whether big or small. 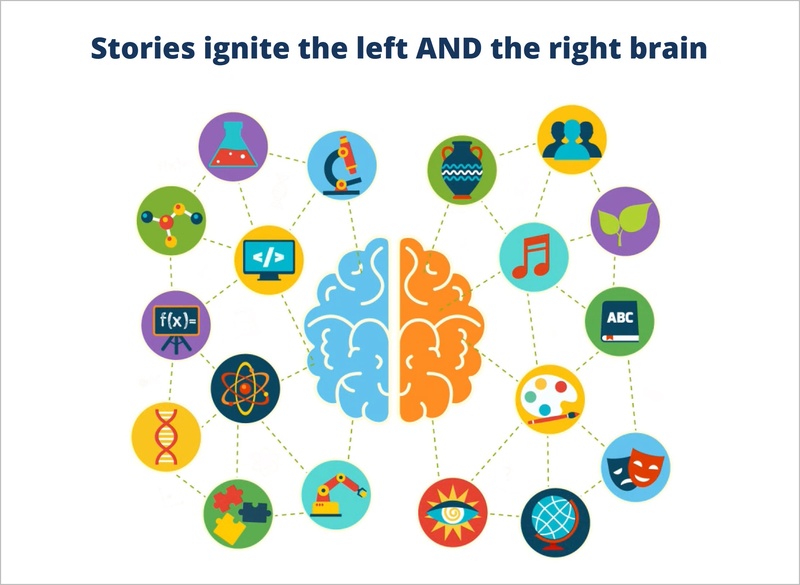 The vast majority of decisions we make are based on both logic (which appeals to the left brain) and emotion (which appeals to the right brain). However, neuroscience has proven that emotion is even more important than logic when it comes to driving a decision – even in the boardroom. The best way to establish this potent, decision-driving combination is by weaving your facts, data, and ideas into a story framework. Anyone that presents data and wants to incorporate their metrics into a digestible,meaningful narrative. Numbers alone won’t tell the whole story. How do you build a story? Characters: Your characters are who or what is affected by the current situation — your customers, employees, or team. Conflict: With the context of setting and characters in place, it’s time to reveal the conflict. Conflict provides the tension that gives your audience a reason to care – and get it resolved. Resolution: With setting, characters, and conflict established, your audience’s emotions will be built up. They will hopefully be ready to embrace your resolution – your recommendation, product, or solution. Your story framework provides important guidance on what is critical in advancing your story, and what is secondary. Establishing a clear setting, characters, and conflict first, gives you a much better chance of getting your audience to care about your resolution. 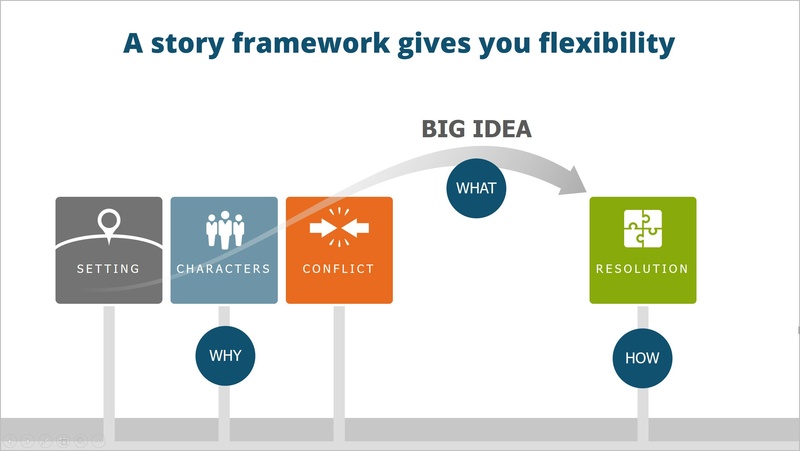 A story framework has another powerful benefit: It creates flexibility within presentations. Depending on audience needs, well-architected decks will expand and contract easily. 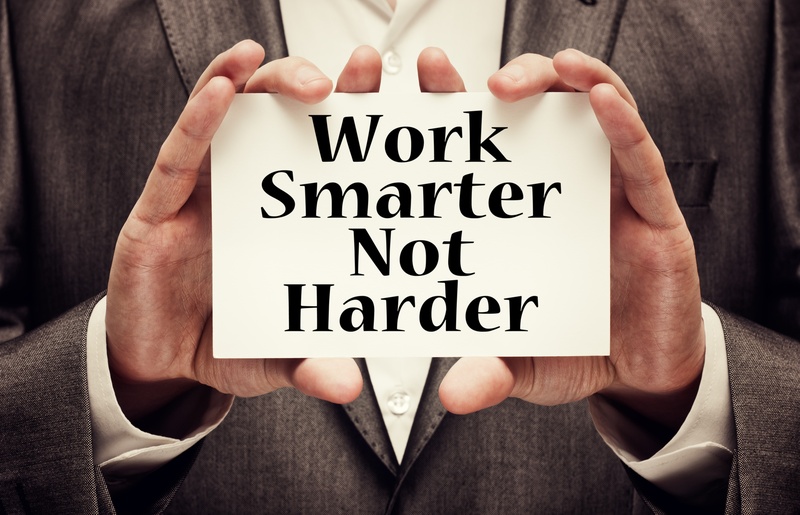 Executives can be unpredictable (and impatient). They might want to suddenly drill down into a chart or fast-forward to the resolution. No matter what, a storytelling framework gives you a roadmap at all times so you don’t get lost and prepares you for a sudden dialogue. The benefits of corporate storytelling are profound. Clear, well-organized, and purposeful communications will catapult careers, further team goals, and create a nimble organization. Does using a storytelling framework mean I have to start every presentation from scratch? Many of us build decks with a big team or “borrow” slides from colleagues. This often creates a hastily cobbled together “Frankendeck” that doesn’t work – logically or visually. The more you understand the patterns of corporate storytelling, the easier it is to incorporate any outside chart, graphic, or anything else. 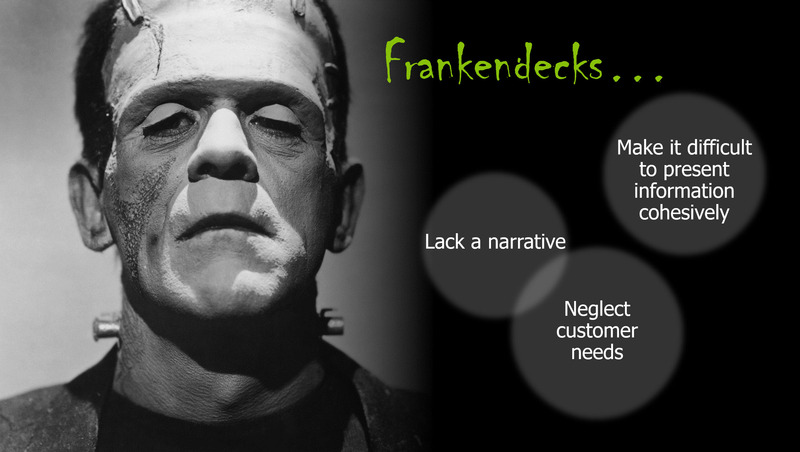 You can still save time by incorporating outside slides but you won’t scare off your audience with a confusing "Frankendeck." What’s the best advice for getting started with corporate storytelling? First and foremost, you must have a clear understanding of your audience. You will do no better preparation than stopping, taking a moment, and walking in their shoes. Imagine what is happening in their world? Dedicate yourself to offering them something that will truly benefit them. 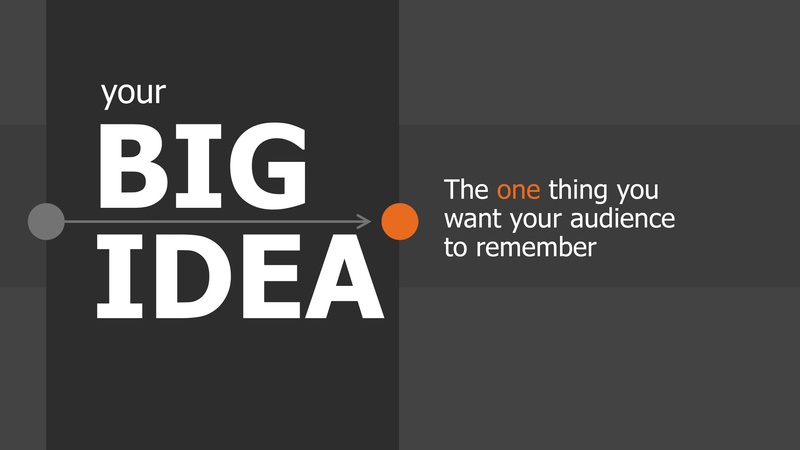 Second, isolate the BIG idea of your presentation. What is the most important piece of information or concept that you want to leave with your audience? It is the through-line that runs through your entire presentation. Every fact or piece of data you include should be supporting and driving your BIG idea forward. Finally, possibly our simplest piece of advice is to advance your story with your slide headlines. As you structure your facts and data into a story framework, shout the main piece of information at the top of every slide. If you look at your slide headlines in isolation of everything else on your slides, they should provide a clear start-to-finish narrative. We believe the tools and strategy used in building a visual story is much like those used in constructing a home. Preparation is critical and should always begin before any actual building starts. What are some great resources to jumpstart corporate storytelling? There is nothing that better jumpstarts storytelling than having a framework to help you organize your ideas into a story arc. This will set the stage for every presentation you make. We have scores of articles about visual storytelling. Our quickest reference on storytelling fundamentals, is our 3-part video series. For a longer conversation, listen to a podcast by corporate storytelling experts here. We also recommend custom PowerPoint templates that allow you to quickly and easily create story-driven narratives. Well-built templates not only save you tons of time when putting together decks, they allow teams to easily pull together a cohesive story, using slides that speak to Setting, Character, Conflict and Resolution. Again, if everyone is using the same story framework and a presentation template built in their brand, organizing a presentation is simple. 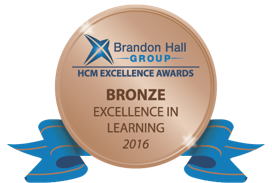 Where can I learn more about corporate storytelling training? The fastest way to develop storytelling expertise is with training. Companies like Facebook, Nike, Fidelity, and Accenture, as well as Learning and Development experts everywhere, have recognized the incredible advantages of investing in corporate storytelling. Everyday, more and more companies are striving to imbue storytelling throughout their organization. The Presentation Company’s workshops, including their flagship Crafting Strategic Visual Stories, has trained people at Fortune 500 companies all over the world. Want to learn more about TPC's Corporate Storytelling workshop? Click here for more info.